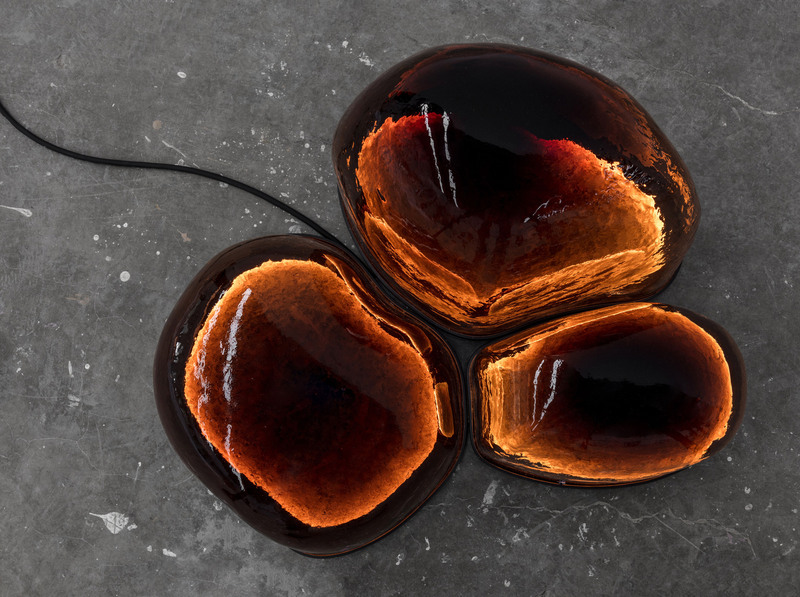 Design collective EWE Studio has used fire to treat the many different materials in this limited-edition collection of jet-black furniture and lava-like lighting. Launched during last week’s Zona Maco art fair in Mexico City, the collection titled Alquimia – Alchemy in English – is the second from EWE Studio. The trio of designs includes a varied range of materials, all of which were altered by fire in some way. The largest of the set is a dining table named Humo, which measures 2.6 metres long and is held up by an off-centre base. 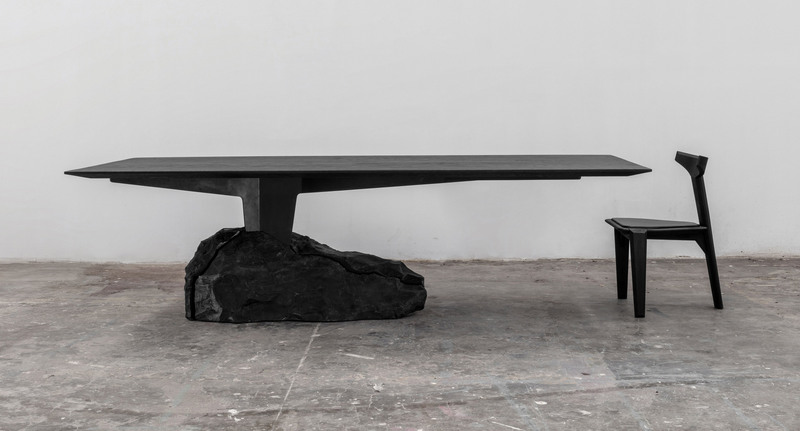 Oiled and burnt steel forms the support, anchored into a 300-kilogramme block of Mexican Orizaba black marble that acts as a counterweight. For the top, a two-inch-thick (five-centimetre) piece of white oak was blackened by hand using a blowtorch, to protect it from weathering and give a unique colour and texture. 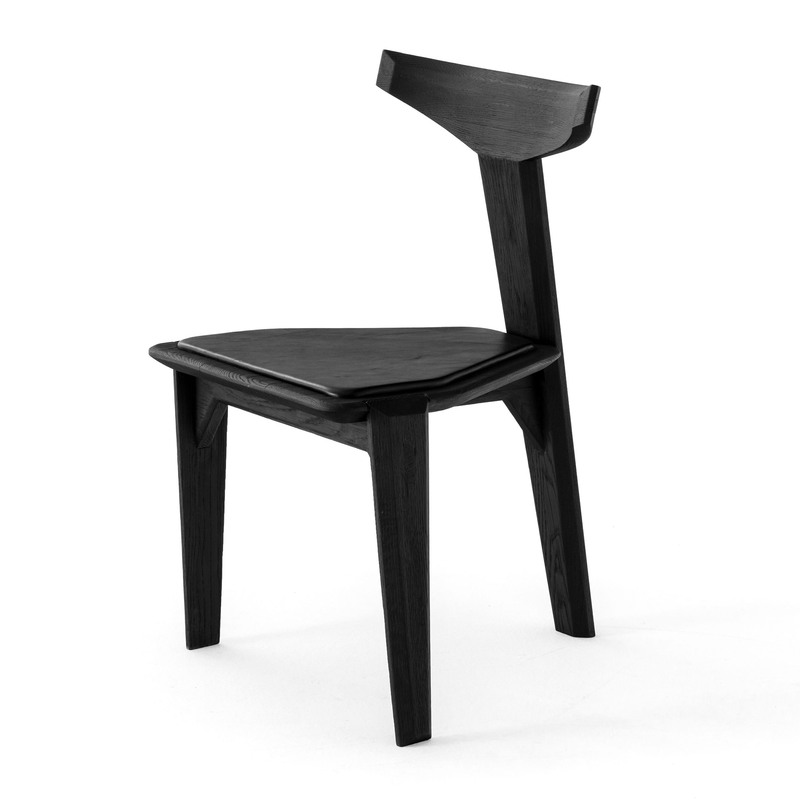 Burnt white oak is also used for the frame of the three-legged Ceniza chair, which has a backrest shaped to resemble a trident. The chair is assembled using an old technique known as Espiga Vista to connect the legs with its leather-covered seat. 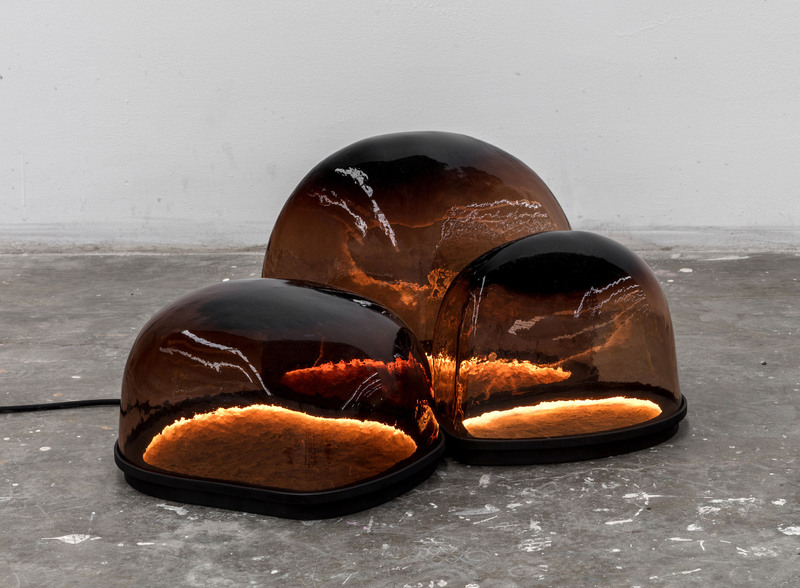 EWE Studio worked with glass company Nouvel Studio to create the Magma lighting series. 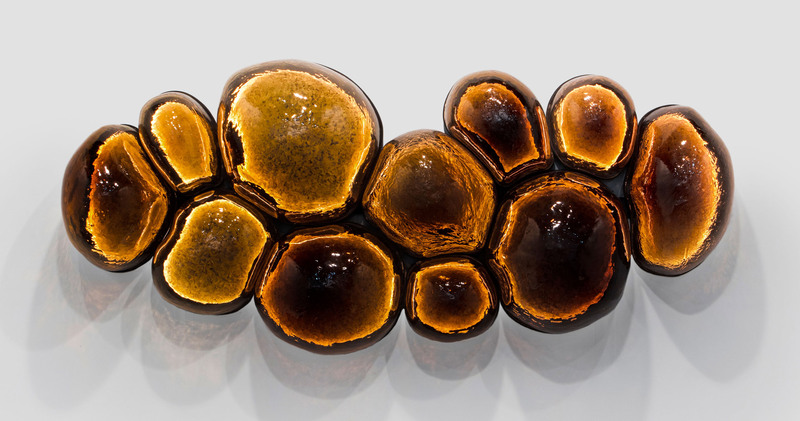 Eleven moulds were hand-carved from volcanic rock to create lumpy forms for the molten glass to be poured into. “The volcanic stone was chosen for the moulds as it is not affected by the heat of the glass due to its origin,” the designers said. 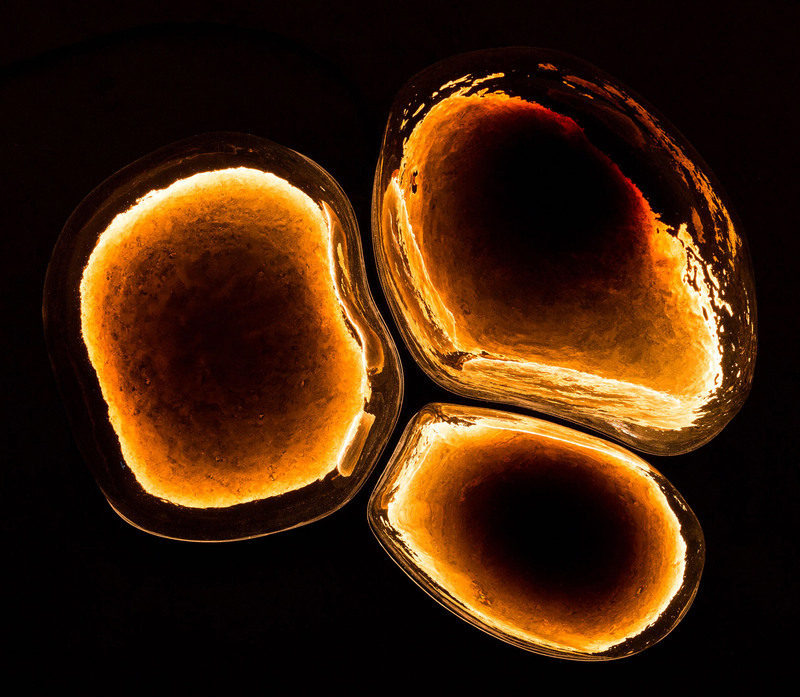 The texture of the rock remains visible on the surface of the amber-coloured glass, which glows like molten lava when the lights are switched on. Bases are formed from the same oiled and burnt steel as the dining table support, while aged brass inside alters the colour and effect of the reflections. The lamps can be used on the wall, floor or ceiling, either alone or in tessellated clusters depending on the required size. EWE Studio was founded by Mexico designer Hector Esrawe, Spanish industrial designer Manuel Bañó Granell, and creative director and curator Age Salajõe from Estonia. The collective aims to use Mexican crafts and traditions to produce limited-run objects, as seen in its Sacred Ritual Objects range released in December 2017. Zona Maco ran from 7 to 11 February 2018, when Esrawe also debuted a collection of walnut and marble furniture. The next edition of the biannual fair will take place in September 2018. The post EWE Studio’s handcrafted Alquimia furniture and lighting is born of fire appeared first on Dezeen.